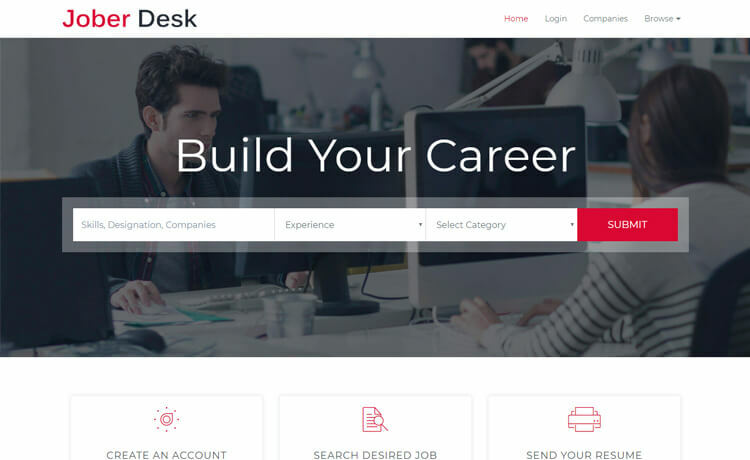 Jober Desk is a free Bootstrap HTML5 job board template. There are a lot of modern and tech-savvy features loaded in the box with Jober Desk. The box is filled with hero header, fun fact counters, sticky top navigation bar, call to action button, testimonial carousel, pricing table and then some. Jober Desk is a free Bootstrap HTML5 job board template. It is a responsive multi-page theme suitable for online job portal, job board, job directory or other similar kinds of job-related website. Moreover, it has a simple and minimal layout with an effective and dynamic design. Jober Desk has an advanced search widget on the header. There are a lot of modern and tech-savvy features loaded in the box with Jober Desk. The box is filled with hero header, fun fact counters, sticky top navigation bar, call to action button, testimonial carousel, pricing table and then some. Intuitive and alterable code inside to make the building process quick and easy. Get your project rolling and make it an outstanding one with Jober Desk. Thank you for downloading Jober Desk. Here are three recommended free Bootstrap HTML5 job board templates. I want above job portal website. And also provide me contact number to contact.